I’ll just say it: I am NOT a fan of Nancy Kassebaum. She says, correctly, that if she were to run today she wouldn’t make it past a Kansas primary. Of course, she blames social media. 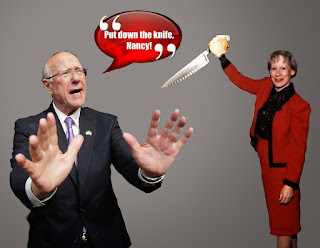 Newsflash, Nance: You’re out of touch – not just in Kansas, but out of touch overall. And it ISN’T because of the Facebook and the Internets. It’s because the people of Kansas gave you 18 years in the U.S. Senate – 18 years to improve, to lead, to meet meaningful challenges – and you used that time to explode the debt, creating a federal culture rich in regulation and overspending. Gross. She supports gun control measures, Medicaid expansion and criticizes Brownback initiatives to lower taxes. And then there’s her monstrous belief that babies don’t have an intrinsic right to life. Of course she wouldn’t make it out of a Kansas primary, and that loss would actually be based on her merit. We should absolutely seek the counsel and advice of our elders. We should value their experience, but we don’t have to kiss a ring or pretend Nancy Kassebaum has some sort of magical legacy. She’s free to regale us with tales of her wisdom, but we should take much of her tale with a grain of salt. She’s no saint. (Actually, I’d call her a bit of a back stabber.) And for the love of all that is holy, let’s stop pretending she broke some mythical glass ceiling for women. Her daddy broke the ceiling just enough for her to work her way through.